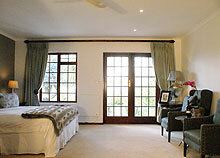 R 1500.00 per room per night for a Garden Deluxe Room/Vineyard Room. R 1672.50 per room per night for a Superior Room.  2 night’s accommodation in one of our Beautifully Decorated Garden Deluxe Rooms or Vineyard Rooms, at only R 1500.00 per room per night, including Breakfast and Welcome drink, including our scrumptious Full English & Continental Breakfast served in our lovely garden with stunning views of the surrounding vineyards.  2 night’s accommodation in one of our lovely Superior Rooms under the Thatched roof and private balcony, at only R 1672.50 per room per night, including Breakfast and Welcome drink, including our scrumptious Full English & Continental Breakfast served in our lovely garden with stunning views of the surrounding vineyards.